Happy New Year, Folks! Our celebration of the birth of the year 2019 is completely spontaneous – we’re spending the last day of 2018 and the first day of 2019 together, we’re back in London after a lovely holiday in Denmark, and Sanoop is leaving for Singapore on 2 January, so we just want to take the day as it comes, having fun and reflecting on the highlights of the year we’re saying goodbye to as well as our thoughts on the one we’re welcoming. Chance Encounter. Upon entering our new favourite cafe in Hampstead, Ginger and White, Sanoop happens to catch the eye of a guy, at whose neighbouring table at the back of the small, cosy room we sit down. They immediately recognise each other – from a whiskey tasting event in Sentosa over a year ago! He is here with his wife and their little daughter. He is American. His wife is German. They lived in Singapore for eight years. They recently moved to London – to Hampstead to be exact. With this what-are-the-chances-energy, we launch into a lovely, long conversation, immediately hitting it off. Before we leave, the woman and I swap numbers and arrange to meet for a reformer pilates class at Heartcore down the road one of the following days, and we all agree to catch up over dinner when Sanoop is back from Singapore. Yay, local friends! Easy! 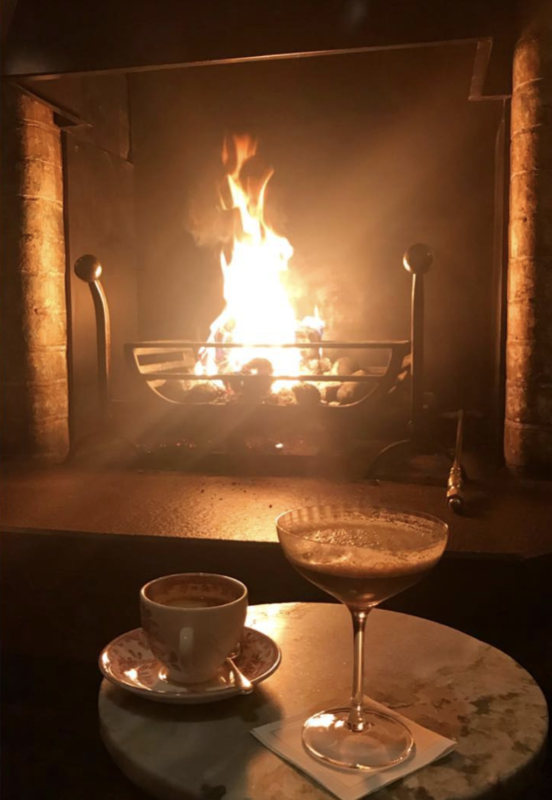 Fireside drinks. Saying goodbye to our friends with big Happy New Year hugs, Sanoop and I then wander up through Hyde Park and Marylebone and decide to see what’s happening at Chiltern Firehouse, one of my favourite cosy hangouts in London. It’s quite perfect this late afternoon – not too crowded to get a comfy seat by the fireplace, yet not so deserted that it feels sad. It’s got that festive spirit – the lighting, the music, the formal attire of the staff, the glowy interior design. Chic and swanky without being pretentious nor too stylised. Sanoop orders a flat white and I an espresso martini. We curl up in a cosy seat and stare into the dancing flames for a while before heading north – with a shopping bag full of tapas-style goodies from Daylesford to enjoy at home with a glass of wine after we’ve showered and dressed up a little bit. Resolutions. I realised that as much as I want to consider myself spontaneous and easygoing, I am pretty preoccupied by traditions, expectations and nostalgia – this is how we do in Denmark, I/we should …., these are some of my sweetest memories … which is good to some extent, as it’s what helps shape me … but I don’t want to let any habits consume or inhibit me. In this new year, I want to aspire to be even more mindful of what feels right in the moment – be open, patient, tolerant and agile when it comes to adapting new and questioning old routines and rituals … at work as well as in my personal life. Parliament Hill. A bit before midnight on New Year’s Eve, a couple of friends knock on our door – our first ever guests!! We head up to Parliament Hill to watch the splendid fireworks show on the Thames, champagne and glasses in hand, ready to pop the bottle and kiss our partners at the stroke of midnight! 16 K. On the first day of the year, my love and I head out in the sunshine for a 16 k wander around Hampstead, Victoria Park (we have lunch at the Pavilion overlooking the lake), Shoreditch, feeling complete and completely happy – except for those moments when it hits me that Sanoop is leaving for Singapore tomorrow to apply for the family visa to come here – it feels like a bit of a paradox that we have to be apart to work towards being together. Oh well… patience… tolerance! London Bridge. The next morning, I accompany Sanoop to London Bridge, from where he hops on the Gatwick Express and I cycle up to the office along completely empty roads. As I chew on my delicious office breakfast, I notice a bunch of emotions churning around in my mind. Sanoop and I have spent most seconds of the past month in each other’s company, settling into a new city and flat together, socialising with colleagues and friends together, travelling to and from work together, even meeting for coffee at the office from time to time, Christmas holidays in Denmark. Through it all, I have been hoping that he really is just as all right with all of this as he appears to be, and I have been trying my best to make it all a lovely, easy experience and panicking slightly whenever I feel that I have failed (even though I know that he doesn’t expect anything), while also being super terrified and excited about work at the same time, as well as about London – I love it, but I also have tiny voices inside my head going: Is it really as magical as I recall? Was it right to move from Singapore? Right of me to suggest we both uproot our lives? Did we really live in a tropical island? I’m unsure whether to just downright suppress these thoughts, seeing as they seem awfully spoiled and ungrateful when written / said out loud, or whether it’s healthy to just get them out (which I’ve then now just done), because they are natural – and temporary. We always make the decisions that seem right in the moment; this one does seem right in all of the ‘right’ moments, i.e. when I am rested and remember to take breathe properly. On the 6:45am tube ride to London Bridge (in Singapore, the (world’s best) airport is never more than a 15-minute smooth, swift, cheap Grab away; here, it takes 2 hours, some walking, and at least two means of expensive public transport to get there, but we’re not complaining – we chose this, and isn’t there also something fascinating and charming about walking in the cool, dark morning air and watching people on the trains? ), Sanoop asks me what I’m grateful for now. My reply: the fact that I get to sit with him right here, and that I know he will be safe and comfortable in Singapore (he is staying with our friends), and that we will be able to communicate in so many ways while he is away (and that the separation is only temporary). Normal Day. On Thursday, I wake up and do a little morning dance to shake out the chilly stiffness in my body and perform my Tibetans. I then walk to work along the canal. Work 9-5:30. Eat all three meals at the office. Do some freelance translations after work, still at the office. Head back home on the tube around 8pm. Light candles in the living room. Make myself a cup of Sanoop’s chai. Blow out the candle once I’m done with the chai. Brush my teeth. Change into a pile of soft, warm clothes. Read and watch news videos in bed until falling asleep a bit past 11pm. Comforted by simple structure. WMN RUN. On Friday, I wake up freezing at 6am and head down to Waterloo, listening to the NYT Daily podcast on the way. There’s nothing like some ice cold sweat, endorphins, @wmnrun running buddies and dark clouds dispersing to reveal a glorious sunrise to brighten a Friday. As per usual, we jog from Origin Coffee Roasters, along the southside of the Thames, across Tower Bridge, back along the river and across Millennium Bridge and back to the cafe for coffee before heading to work. Another comforting action. The Favourite. After work on Friday, I meander around Spitalfields, wishing Sanoop was there with me to experience the bustling vibe in those stately Edwardian and shining futuristic streets, lanes and plazas … And then I meet a friend for a glass of red wine at Shoreditch House followed by a screening of the ‘strong, weak, sly and servile’ female characters-driven historic comedy The Favourite at Rich Mix, our old go-to cinema when she and I lived together around the corner from it in Swanfield Street. Every aspect of the evening is sublimely enjoyable. Weekend. Hampstead Heath, alone. Missing Sanoop. Morning runs on the frosty Heath, stopping to take in the sweeping city panoramas from Parliament Hill. On both days, I go for a reformer pilates class at Heartcore in the village. It feels quite wonderful to walk through my little ‘hood for a local activity, and the teachers turn out to be wonderful as well, as does the ambiance and the tough and satisfying workout! Too bad it’s bloody expensive – my conscience tells me I should restrict myself to the free workouts at work, combined with my own barre practice. (But if I really love this so much?) I have long conversations with Sanoop, who is making the most of his time in Singapore, and I have a friend over for dinner each evening, both of whom I met in Singapore. They are both from and have moved back to London, one to Brixton and one to Islington, and they are both considering to say yes to job offers in America, haha…! For now, though, we’re all here, and I enjoy doing food shopping and cooking them – the same very simple – dinner. Those little things that make the village and the flat feel like home. Kale salad full of fresh orange juice and nuts, sautéed salmon, oven-fried sweet potatoes and tomatoes, Malbec, candle lights, Bossa Nova soundtracks… On Saturday morning, I pick up the FT Weekend and the Guardian at our local newsagent and browse through the next-door Daunt Books, where I buy Michelle Obama’s book and Rivers of London, the latter of which came recommended by all of my colleagues, who collectively describe it as a mix of CSI and Harry Potter. When the lady in the bookstore tells me that the author lives just around the corner as well, I am even more sold. I choose Ginger and White for my Saturday spot for reading and watching people and dogs, and Biggie Best for my Sunday spot. And, finally, one additional comforting/homely action item for the weekend: I buy a paintbrush with which to patch up some brownish patches on our white walls (our landlords left a bucket of white paint in one of our cupboards).